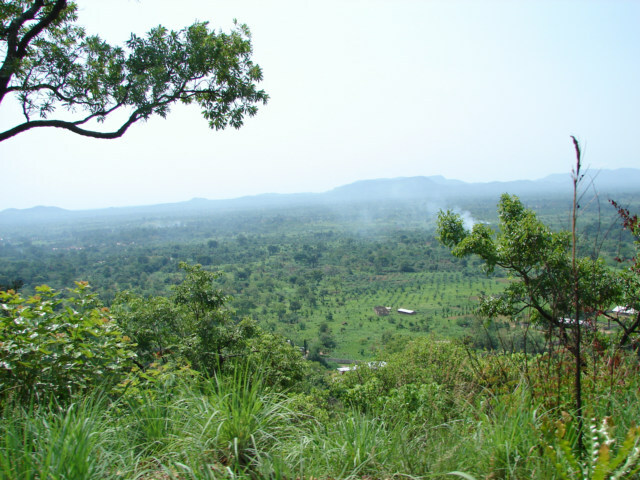 Immediately upon leaving Adeta by moto, we proceed to climb the side of a small mountain range here in Togo. This may be called the Danyi Plateau; I am not sure, I could check on the maps, however there are no lights presently in my room as they went off now at 6:30 pm, I expect them off until morning, however hard to say. Nonetheless, we climbed this mountain range, and then proceed to travel around sort of on top of the mountain range. I feel a little silly calling this a mountain range as the altitude is only about 750 Meters above sea level, and the highest in Togo is only about 1000 meters. There is maybe a small airport below with a dirt runway, the boy told me something about a helicopter at the hospital, however seems like an overkill for the number of people and the amount of money here. iew as we left the village of Adeta and climbed the side of the mountain range.